The fire had been especially difficult to put out as experts estimated it was some 25 feet down inside the rubbish pile and required not just dosing but excavation and turning of the landfill to allow firefighters to direct the water cannons. Officials explained that deep wells were successfully drilled, supplying water for the crews. Heavy equipment operators, under the direction of fire crews, are working with the Fire Services Department to expose the deep-rooted flames. Eric Bush, chief officer at the ministry, which now oversees the fire service, said he was happy with the progress made since Wednesday. The source of the fire, which began in the early morning hours of Wednesday 12 February, is still unknown and is under investigation. 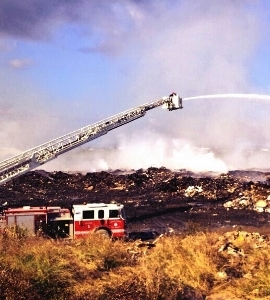 The fire was contained to unprocessed trash and at no time was it in danger of spreading to dumped tyres or vehicles. Bush and the chief officer at the Ministry of Health, Jennifer Ahearn, as well as other stakeholders will meet next week for a debriefing of the events surrounding the fire and efforts to put it out. Dr Kiran Kumar, the medical officer of health, said that the Health Services Authority has been monitoring carefully for any occurrence of health problems due to smoke inhalation since the fire started. So far, no illness related to smoke has been reported. Health Minister Osbourne Bodden, who is responsible for the dump, said he was relieved that there were no reported cases of illness related to thesmoke, and apologised to the public for any inconvenience or discomfort they may have experienced during the past few days. Bodden also praised the work of the firefighters and Department of Environmental Health staff. The fire reinforces the decision of the ministry to form a multi-agency steering committee to spearhead the development of the Cayman Islands’ planned waste management system. “I must reiterate what I said before. These fires only serve to underscore the fact that it is of critical importance to the country that we find a sustainable solution to waste management,” he said. The committee held its first meeting on 22 January. Its remit is to provide government with their best technical advice, take responsibility for the business issues associated with the project, approve budgetary and procurement strategy, define and realize benefits and monitor the risks, quality and timeliness of the comprehensive waste management system. Love the, "there have been no reported cases of ill health related to smoke inhalation." Apart from the fact all that means is none they have been told about, give things a few years and then se how much damage these fires are doing to the health of local residents. This is a health timebomb. Great. Who is going to clean the black soot off my house?